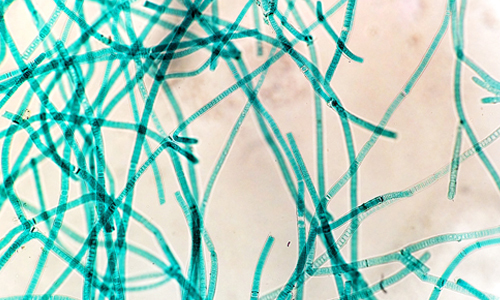 Cyanobacteria are named after the word ‘cyan’ meaning a ‘turquoise blue’ color. Hence, they are also called as blue green algae. Cyanobacteria are prokaryotic organisms where as green algae are eukaryotic organisms. Cyanobacteria can photosynthesize which means they have the ability to produce their own food by using sunlight. Cyanobacteria as compared to green algae are potentially dangerous to the ecological environment of the aquatic organisms. This is because, they release certain toxins which are harmful for other plants, insects, snails etc. They are also toxic to other algae that eat microorganisms called zooplankton and fish. Green algae on the other hand provide a source of food for the zooplankton to grow and flourish. Algae are small unicellular organisms whereas cyanobacteria are multi-cellular organisms and larger in size. Algae being a eukaryote, have a nucleus, mitochondria, and a chloroplast within each cell. They also have an eye with which they detect and identify light source and capture light in order to produce energy. This process is called as photosynthesis. Cyanobacteria lack a nucleus and mitochondria. They perform photosynthesis by using water as a source of electron and create oxygen. Green algae are found in lakes, oceans and fresh water bodies. Some even grow in soils and live in tree trunks. The overall population of Green algae is estimated to be more than 500 genera and 8500 species. Cyanobacteria are found almost everywhere, including aquatic habitats like lakes, ponds, to terrestrial areas like sand, bare rocks and damp soils. They flourish in extremely high temperatures, as high as 60 degree Celsius and shallow waters. The total species of cyanobacteria includes 150 genera and about 2500 species throughout the world. Green algae can reproduce sexually, as well as asexually. Cyanobacteria reproduce asexually with the process of binary fission, fragmentation or spore production. They do not have flagella and hence lacks mobility. Green algae have a nutrient value similar to most of the green plants. They are a rich source of vitamins and minerals. They have medically been proved as a necessary food supplement. They also have a high content of rich fatty acids. They have recently been proved beneficial as biological fuels; however, they have not come into use commercially due to their economic availability and feasibility. Cyanobacterias are both toxic and therapeutic depending on the sub species. They can produce certain neurotoxins or cytotoxins. This can cause potential harm to the human, aquatic and animal sources. The cyanobacteria produce a large amount of toxin during summers as the temperature of the lake or pond rises and this favors maximum development of these bacteria. Certain cyanobacterias such as spirulina are beneficial and act as a great source of proteins, amino acids, vitamins and antioxidants. They also hold a high value in anti viral therapy especially in herpes and HIV. Both green algae and cyanobacteria have evolved from algae. Based on their structure, they are differentiated into prokaryocyte (cyanobacteria) and eukaryocyte (green algae). Green algae are symbiotic which means they can produce lichen symbiotically (living in harmony) with fungi. They are a source of food for the aquatic microorganisms whereas the cyanobacteria prove can be helpful or harmful based on the sub-species. Cyanobacteria are blue green bacteria and cannot perform photosynthesis the way green algae can. rachita. "Difference between cyanobacteria and green algae." DifferenceBetween.net. October 17, 2014 < http://www.differencebetween.net/science/biology-science/difference-between-cyanobacteria-and-green-algae/ >. Overall a good article, however, you say “They do not have flagella and hence lacks mobility.” but I have personally observed complex movement of Spirulina – a cyanobacteria – under the microscope. I’m not disputing that they do not have flagella, but I do dispute that they lack mobility. I have taken video of this movement. I also observed that Spirulina is sensitive to photo-toxicity and so moves around other Spirulina so not to get too much light. In a few of my experiments a culture died because there were not enough cells to protect each other from the light. This is just one example of mobility, but also is an example of an ability to detect and respond to light. Hi Elliander Eldridge. You are probably observing Brownian motion, which is fairly common when you see specimens under a light microscope. IN THE FIRST PARAGRAPH YOU TOLD BLUE GREEN ALGAE PERFORMS PHOTOSYNTHESIS BUT IN THE SUMMARY IT IS SAID THAT THEY CAN NOT. I think he meant they can not do it the way Green Algae does. But photosynthesis does take place in them. In structure and habitat, you said cyanobacteria were multicellular and that algae were small and unicellular then the opposite at the bottom( which was the right one). This is a really big mistake, and green alage can range from a multicellular organism to a unicellular organism ( examples are Chlamydomonas and Volvox ). Brown algae are the only kind of algae species that can be only multicellular. Cyanobacteria is prokaryotic and cannot be a multicellular form. It might be wrongly typed.